Recent advances in ultrashort pulsed laser technology have opened new frontiers in atomic, molecular and optical sciences. 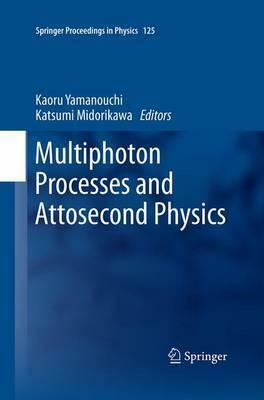 The 12th International Conference on Multiphoton Processes (ICOMP12) and the 3rd International Conference on Attosecond Physics (ATTO3), held jointly in Sapporo, Japan, during July 3-8, showcased studies at the forefront of research on multiphoton processes and attosecond physics. This book summarizes presentations and discussions from these two conferences. Illustrations note XVIII, 416 p.
Strong field phenomena.- Molecules.- HHG.- Few-cycle pulses.- Atto-applications.- Imaging.- Filamentation.- New spectroscopy.- XFEL.- Surface & materials analysis.